My kids and I (age 9 boy, 14 girl) really enjoyed this book. I know there’s a lot of controversy around it and the lies the author has told and mismanagement of funds…but it doesn’t detract from what my kids and I learned from this book. And that is that education makes all the difference in the world. Even if this were a completely fictional story (it’s not…yes, large chunks of it are fabricated, but the main message is true and the fact that Greg Mortenson has indeed built schools in that area of the world and does truly care about those people…) I would have loved it. I homeschool my kids and have a hard time explaining to them sometimes why education is so important. It’s sort of a given in our country (US) and there are times when education seems tedious to them (a challenge I’m constantly struggling with, as I don’t believe education should be unpleasant) so this was a wonderful story to introduce the idea to them that not every child in the world has the privilege of getting an education…and in those countries, the building of a school and the learning of the basics of how to read and write and learn about the world around them make a huge difference in the lives of the people living there. Just looking at the topic of girls and women are treated in many third world countries…if every girl got an education and learned that this isn’t so all over the world, I wonder what a difference this would make to the plight of women and girls in these countries. When you don’t know that there’s even an option of being treated equally, why would you question it? My kids and I discussed these topics because of this book, so bravo Mr Mortenson! I thank you for bringing these issues to my children in a format they could really understand. 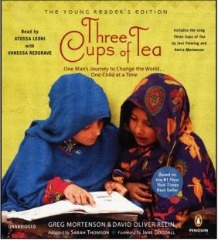 I highly recommend this children’s version of Greg Mortenson’s book for anyone with kids. You may choose to tell your kids the controversy over it, but I chose not to while we were reading it, as I didn’t want it to detract from the message of the story. I probably will talk with them about it now that we have completed the book, though, but will also point out that while some of the story is false, much of it is true, and even though some parts are false, that sort of thing (village hospitality…kidnapping in the Middle East by terrorists…) truly does happen. Great story and I hope the CAI are able to get their act together and make up for all the lost revenue and time they suffered as a result of Greg Mortenson…and that Mr. Mortenson can find a way to make up for it as well, and continue on to do great things. It’s evident that his heart is in the right place, he just needed to have a reality check on some of his decision making. Considering that the one interview I saw said that CAI is down 80% in revenues due to the controversy, I think that lesson was indeed learned. But don’t let the controversy stop you from reading this great book and from thinking about this issue of education in countries where schools are few and far between. Greg’s right, education is truly the answer to world peace. BOOK REVIEW: Have you heard of the "Chrestomanci" series? Tina’s Nature Adventures are coming! !